I received an email from a reader with a bright financial future. 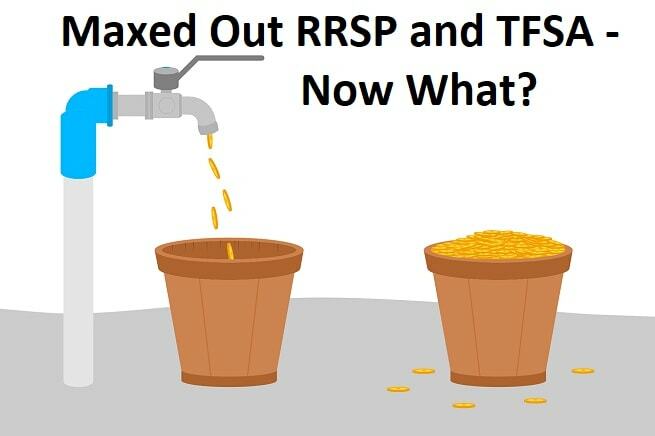 She has both her RRSP and TFSA maxed out and wondering what to do next. First of all, thank you for sharing your wisdom and financial journey. I love reading your blog and I learn so much from it! I was wondering if you could give me some advice on where to put my money after maxing out my RRSP and TFSA contributions. I saw on your website that you suggested Horizons as a tax-efficient fund. I’ve read that others put it in Canadian dividend stocks. There are so many options out there, so frankly, I’m getting quite confused. I’ve also always done our taxes just it’s just basically filling out forms. I’m worried that when I start investing our extra funds in a non-registered account, it will be a disaster come tax time. Would welcome any insight you have on this. To start, more details are needed such as, what other assets does she have? Does have a defined benefit pension? Does her spouse have a defined benefit pension (if she has one)? Are they considered high income? Without those details, I’m going to make the response a little more broad with the benefit of applying to more readers. For people new to investing, RRSP’s and TFSAs are a type of account, not an investment type. You buy investments to put in these accounts. These accounts allow investments to grow tax-free which means the investments do not need to be reported when you file for your taxes. There are still major differences between the two accounts. RRSP deposits give you a tax deduction, but you will be taxed at your marginal rate when you withdraw. The main strategy around using an RRSP is to maximize your deposits when/if you are a high earner/highest tax bracket, and withdraw when you are in a lower tax bracket during retirement. TFSA’s, on the other hand, do not give you a tax deduction on your deposits, but the account will let you withdraw from the account without reporting the income (ie. tax-free withdrawals). This can come as a big tax advantage for those with defined benefit pension or other retirees with higher base income. Which is better? I would say for most Canadians, it’s in their best interest to max out their TFSA before going after your RRSP – especially those with lower to average income. For government workers with a defined benefit pension, no doubt TFSA is better due to higher income during retirement. For high-income earners in top tax brackets, RRSP’s may work out better providing that they re-invest their RRSP deposit tax refund. Back to the point of the article, RRSP’s and TFSA’s can be powerful wealth generators as it eliminates a big investment drag – taxes! The best move for most investors is to maximize tax-sheltered accounts before investing within non-registered, or taxable, accounts. What if both the RRSP and TFSA are maxed out like in the reader’s case? It looks like the reader has done a great job with her savings to maximize her RRSP and her TFSA and looking to possibly invest the surplus cash flow. Judging by the email, she’s also interested in keeping taxes as simple as possible. To do that, I would suggest a couple of options before even considering investing within a non-registered/taxable account. To keep things as tax efficient as possible, I would look at other efficient ways to spend excess cash flow. To start, an obvious one, pay down debt. If there is an existing mortgage or other debt, it would make sense at this point to take the extra cash flow to pay it down. Even though interest rates are relatively low right now, it’s a guaranteed after-tax return, and rates will likely be higher during renewal time. After all, one big milestone to achieve before retirement is to be 100% debt free. Another option to consider if the reader has children is a registered education savings plan (RESP). This is another type of account that allows investments to grow tax-free. While there is no tax-refund for deposits, taxes are paid by the student (which should be low) when the funds are withdrawn for post-secondary education. If all debt is paid off, and the RESP is maxed out and you still have extra cash flow – then it’s time to look at non-registered investments. That’s a big topic in itself, so let’s dig in a little. Let’s dig into the good stuff – investing! I like to configure my accounts as one big portfolio to help minimize taxation. If you are like the reader with both RRSP and TFSA maxed out and looking to invest, you may need to re-arrange your investments to fit the “one big portfolio”. As you can see, it may make sense to pull all Canadian equities out of your tax-sheltered accounts and place in the new non-registered/taxable account due to the tax efficiency of Canadian dividends. You can read more about the tax efficiency of Canadian dividends here. Fixed income and international dividends are taxed at 100% of your marginal rate (inefficient) which is why it makes sense to keep them tax sheltered. If you have a big defined benefit pension to look forward to in retirement, you’ll need to keep an eye on the old age security (OAS) clawback threshold. In 2019, that threshold is around $77k. Depending on your pension income in retirement, it makes sense to max out your TFSA first as withdrawals do not count as income. If you still have extra cash flow, pay off debt first. Once the debt is eliminated, do some careful calculations on how RRSP withdrawals will impact the OAS threshold. Otherwise, it may be a better idea to go the non-registered route with tax efficient investments. While investing for capital gains within a non-registered account is ideal (only 50% of the gain is added to income), you’ll have to be careful of dividends as they are “grossed up”. The grossed-up amount is counted towards income thresholds like OAS during retirement. If you are interested, the article is a little dated but the core information is solid on the OAS clawback. I think that portfolios should be diversified across multiple geographic markets, and the easiest way to do this is via index ETFs. If you are new to ETFs, I’ve been talking a lot about the all-in-one ETFs lately as the easiest way for an investor to set up a low-cost diversified portfolio. TFSA: Bond Index (VAB), Canadian REITs (VRE) and/or other high yielding Canadian equities. If you have minimal RRSP space due to a defined benefit pension, you can put your ex-Canada holdings here as well. Another option, if you like to research and follow stocks on a regular basis, is to buy Canadian dividend stocks for your non-registered portfolio while using ETFs for your ex-Canada (ie. outside Canada) exposure. At least that’s what I do for the most part. For ultimate tax efficiency for the non-registered Canadian equity allocation, the reader read my article on the Horizon’s ETFs who have created index ETFs that pay 0% in distributions or dividends. Instead, you will only be taxed with capital gains tax when you sell down the road. The dividends are still there but used to compound instead of being paid out. Great deal right? It was good while it lasted, but the last federal budget has indicated that the party is over. It hasn’t been determined how they will tax those “swap” ETFs, but there will be changes. Likely enough to make them not as attractive, which is why I would say to avoid these ETFs until there is more clarity. If you have maxed out your tax-sheltered accounts – congratulations! The next easiest steps are to pay off all of your debt and open an RESP if you have kids. Once the debt is eliminated (and RESP maxed out), and you are ready to set up a new non-registered account, you may need to restructure your portfolio to the “one big portfolio” concept as described above. This will involve keeping all your fixed income/REITs/ex-Canada equities tax-sheltered while moving your Canadian equity holdings out to your non-registered account. I wouldn’t be recommending any of the swap based ETFs to anyone anymore!!! The new Federal Budget, that was announced last month, stated that they will be changing the tax laws to close up this “loop-hole” so their preferential tax treatment is more than likely gone. Great article Frugal Trader. We max out our RRSPs and TFSAs every years. When our first kid was born a number of years ago, we’ve been max out RESP as well (now with 2 kids and we still max out their RESPs). Once all the tax-sheltered accounts are maxed out, we invest in taxable accounts. Like you mentioned, we only buy Canadian equities to make sure we are tax efficient. Congrats on your financial success Tawcan! Since you’ve got it made if all your tax shelters are full and debts paid off, could be time to consider the rest of the world. If that seems too painful, there are some ethical and venture funds that specialize in helping out. Good point Brett, I also believe in giving back. Our family does it through financial contributions to charities and some volunteer work. Under your Investment Ideas – Assuming you have a long timeline, wouldn’t you rather put your equities in the TFSA and the bonds in your RRSP? This will allow the TFSA to grow (and cashed out) tax free. Every dollar you take out of the RRSP is taxed at your marginal rate, so you don’t really want this account having millions in it while your TFSA is only increasing 2% per year. That is a great question Brandon and something worth investigating. I’m going to look at some software packages available to try to model those scenarios. What about “investing” in life insurance plans? Load them up to build cash value, then borrow against those values to generate tax-free income in retirement. At death, loans are paid off with the death benefit. I’ve never been one to go after whole-life insurance strategies mostly because of the high fees involved with investing the “cash” portion of the plan. Can you provide an insurance scenario that would work out better than a regular non-registered investment account with low fee ETFs? Great article, one point to clarify about RESPs: you state “While there is no tax-refund for deposits, taxes are paid by the student (which should be low) when the funds are withdrawn for post-secondary education. ” … in fact, taxes are paid by the student on the government grants and capital gains/interests from the investments, while the capital is taken out tax-free… it’s a great way to reduce taxes on your gains, while helping out your kids get an education that is so critical these days! Thanks for the clarification Steph! All the best . How about spending it? You’re well set for financial security and retirement. It’s ok to enjoy life now as well, as you could get hit by a bus tomorrow. Spend it on experiences if you’re not a materialistic person. Or donate some to a charity you value. Pay down debt if you have some, but don’t be so focused on the future as you are only this age once, and never again. Fitness and health are generally on a downward slope after your thirties (aggressively for some, imperceptibly for others). Some very good points Nobleea! It’s all about striking that balance between now and the future. Just curious, why do you recommend VRE for a REIT ETF? Another tax sheltered idea that may make sense for some is to put the extra money into a bigger principal residence. This may not make sense for all, and results may vary depending on the real estate market. Any capital gains on a principal residence are not subject to taxes. I plan on doing this once my current home is paid for and my family requires the extra space which will both occur in the next few years. While the investment buckets per accounts are a good guideline, make sure you do the math on the actual taxes you have to pay. For example, you can own Google in a non-registered account and the tax rate will be the same as holding Shopify for example or holding Royal Bank for the capital gains. I hold Visa in my TFSA and pay the withholding tax of 15% on 1.4% for a whopping 0.21% tax on the dividend for a solid high return investment. Do the math. Sometimes, paying a bit of taxes for a higher return can pay off. Good point! ex-Canada holdings that pay a low dividend would be ok in a taxable account. VAB in a TFSA? TFSA is tax free, so go for higher ROI. Bond funds are not high ROI. I am in the same situation: most of my money must be allocated to non-registered accounts. I have run countless combinations of parameters through spreadsheet models for retirement spending and tax optimization. VAB in TFSA is not ideal. Put lower-yielding fixed income instruments into an RRSP instead. Next post: Exclusive Dividend Newsletter Promotion, Tim Hortons Rewards, and the Risks of Joint Bank Accounts! Previous post: The Financial Freedom Crossover Point – The Ultimate FIRE Indicator?